After the Gmail disaster, we must be clear about one thing that even Google is not safe to be banked on regarding your Business as your business might be using many of the awesome Google Apps for your organisation. The thing is most of the Google products are always beta. Even Gmail is. So it will be very wise for webmasters to keep track of the performance information for Google Apps services. And Google has made this tracking even simpler. In response to the Gmail outage yesterday, Google has just launched the Google App Status Dashboard. 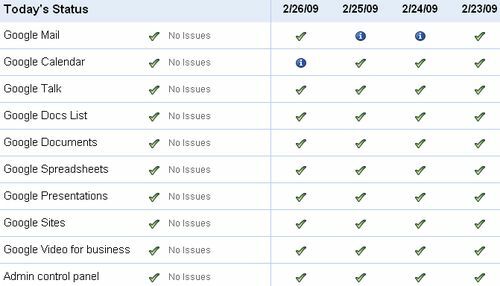 The dashboard offers an at-a-glance look at the system health of most popular Google services, including Gmail, Google Calendar, and the company’s suite of web-based document editors. This status information applies to consumer services as well as services for organizations using Google Apps. Webmasters must subscribe to the Appstatus feed and keep this feed in the priority reading list of their feed readers, so that in case of any Google service failure, they will be able to handle the situation better as they would be knowing that it was coming. An update on the Gmail Outage is also available as a report from Google. A related article to the gmail outage and this article can be read here.